The building of ACROS (Asian Cross Roads Over the Sea), a multipurpose convention and cultural centre, located in Tenjin, Japan is a remarkable 14 storied, 60 metre high building which from the one side looks like a conventional glass building but its other side is a vast terraced (stepped) roof garden that merges with a nearby park. 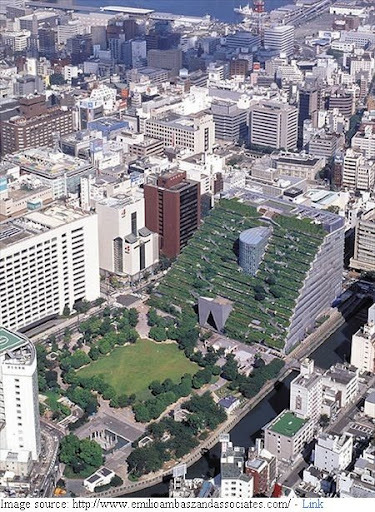 Completed in 1995 it has a floor area of 97,400 square metres and besides the offices of ACROS it also houses 2000-seat symphony hall, conference facilities, government and private offices, shops etc as well as large underground parking. The building was constructed on the last remaining green space in the downtown area, so the architects, Emilio Ambasz & Associates, created a design to preserve the green space as much as possible, while still fitting in a large office building.